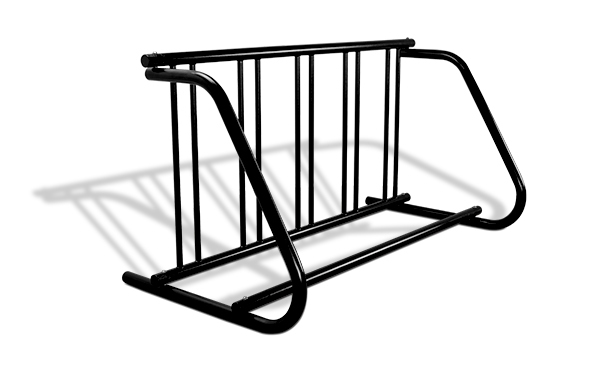 Our Single Entry Grid Bike Rack is a compact version of the 'school yard' bike rack, securely holding upto 4 and 5 bicycles. The single sided design makes it perfect for positioning against building walls, walkway borders	or anywhere that space is limited. This helps reduce sidewalk clutter, great for high traffic areas, while providing peace of mind for bike security. The lower crossbar will help keep bikes in an upright position when parked. Tire slots are strategically spaced to accommodate the vast majority of conventional tire sizes and allows for two point securing with just about any popular style bike lock. These imported grid bike racks are created utilizing high quality steel tubing while featuring welded grid panels and precision bent frames that supply exemplary stability. They are sealed in a superior corrosion resistant powder-coated finish that protects against rugged use and various weather conditions.